The Gunpowder River is flowing at 96 Cfs is clear and 50 F. Fish are still taking dries from Bunkerhill Rd. through Falls Rd. access points. Blue Winged Olive mayflies and small grey midges sized #18-22 have also been tricking a few rainbows. Be sure to bring along some gloves if you’re planning on doing some early morning nymphing. Alex and Max were both fishing the Gunpowder over the holiday break and reported good fishing with dries and streamers and relatively few anglers along most stretches of the river. 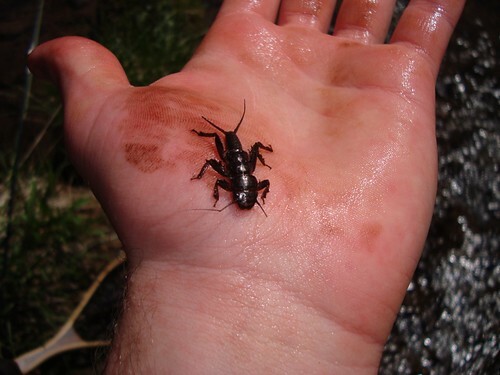 Large stoneflies, like the one pictured above, can be imitated by using large Copper Johns rigged with plenty of shot and a large indicator. This setup allows one to cover the slots and runs and to fish deep through the boulder pools in search of Moby trout. This entry was posted in fishing report on December 2, 2009 by Theaux Le Gardeur.